Guardrails are installed on California roadways to help keep motorists from straying off the road in the event of an accident. When guardrails work correctly, they save lives by preventing impalement, slowing vehicles down safely, and keeping vehicles from being deflected back into oncoming traffic. However, malfunctions in the Trinity ET-Plus and Lindsay Corporation X-Lite guardrails have been linked in a number of serious or fatal accidents. Trinity ET-Plus guardrails are manufactured by Trinity Highway Products, a company based in Dallas, Texas. In the original design, the end terminal cap is intended to absorb the impact of a crash, while the wooden posts break and the guardrail collapses. However, design changes made in 2005 resulted in the guardrails malfunctioning and spearing or flipping a vehicle instead of absorbing the impact of the crash. Since the design changes made to the ET-Plus guardrails were not immediately reported to the Federal Highway Administration as required by law, the resulting accidents have been the subject of a number of lawsuits. Trinity Highway Products ET-Plus guardrail and end terminals have not been installed on California roadways since 2016. However, they were once the top choice of the California Department of Transportation and are thus still seen on many of the state's 396,000 miles of roadways. The guardrails are being replaced as needed due to construction projects and accident repairs. X-Lite guardrails manufactured by Lindsay Corporation make up only about one percent of the guardrail systems installed nationwide. However, these systems have been implicated in a disproportionately high number of fatal accidents. The X-Lite guardrails are intended to slide into each other when struck by a car to absorb the impact of the crash and keep the metal of the guardrail from penetrating the vehicle. Multiple crashes have been reported where the guardrail ends have ended up impaling cars and killing the vehicle occupants. Lawsuits filed against the Lindsay Corporation allege the guardrails are improperly designed and have frequently been incorrectly installed due to the manufacturer’s inadequate instructions. There are also allegations asserting the Lindsay Corporation improperly submitted biased and inaccurate safety test results when obtaining approval for its guardrail design. If you believe you or a loved one has suffered injuries caused by faulty guardrails on California roadways, you may have a valid claim against the government agency which is using the defective product as well as a product liability claim against the manufacturer or installer. This type of case can provide you with compensation for medical expenses, lost wages, and pain and suffering. In cases involving fatal accidents, survivors can receive compensation for the deceased person's medical expenses up to the time of death, pain and suffering if death was not instantaneous, lost future wages, and the loss of their relationship with the deceased. 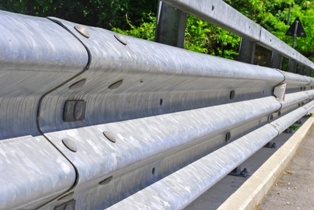 Cases involving injuries caused by defective guardrails can present special challenges. To win your claim, you must provide evidence establishing that the injuries suffered were the result of the defective guardrail and not attributed solely to the accident. You also must file your claim promptly to prevent the expiration of the statute of limitation and the loss or destruction of the evidence. A claim against a government agency must be made within six months of the accident to protect your right to file suit. This requires working with an experienced attorney familiar with product liability and government liability claims and car accident lawsuits. Inland Empire Law Group can help protect your right to compensation with a no-cost consultation. Call (888) 694-3529 to schedule an appointment at our main office in Rancho Cucamonga or our satellite office in Victorville.